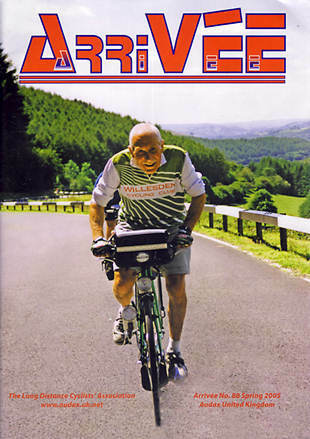 Here is a great picture of Jack on the front of Audax UK’s Arriveé magazine. Note the baggy shorts, plimsolls and fully integrated bar bag/pipe holder. Jack was a charming man who was admired across Audax, as can be seen by the many tributes to him on the YACF forum. I rode the Boston-Montreal-Boston with Jack. He had to wear a helmet which he hated and managed to leave it at the Montreal control, accidentally of course! The organisers sent it down route but Jack managed to leave each control before his helmet arrived only being reunited with it at Boston! He made a rare sight in his “desert rat” shorts and vest. While all around lycra clad riders were discussing healthy food and drink he just tapped out his pipe out on the top tube of his bike! Mind you he got far more attention from the girls that all the young bucks put together!! I remember Jack. He was always one of the first to pay his subs! He used to ride from his home 30 miles away to the club dinner at Ickenham and then ride home again.